November 3, 2016 - Like us now! Punjab Information Technology Board’s initiative “Herself” has become the first project in Pakistan to collaborate with Facebook’s economic empowerment initiatives. This was announced at the launch ceremony of Herself’s partnership with Facebook’s “SheMeansBusiness”, which was held at Arfa Software Technology Park and attended by more than 300 women from all walks of life. Ritesh Mehta- Country Head of South Asia for Facebook’s #SheMeansBusiness appreciated the effort Pakistan had put in to empower women and how excited Facebook’s team was for it was their first initiative towards promoting economic growth in Pakistan. Through Herself’s collaboration with Facebook’s #SheMeansBusiness , Facebook will share its expert trainings on how women can use Facebook, and Instagram to boost their businesses. In return, Herself will provide them with case studies of our local successful women which will soon be published on their global website kicking off global marketing for our women. Herself held a launch ceremony on the 2nd November, 2016 and invited other women empowerment initiatives such as Circle, Women Chambers of Commerce, Pakistan Society for Training and Development to elaborate how as a community they can benefit from this partnership. 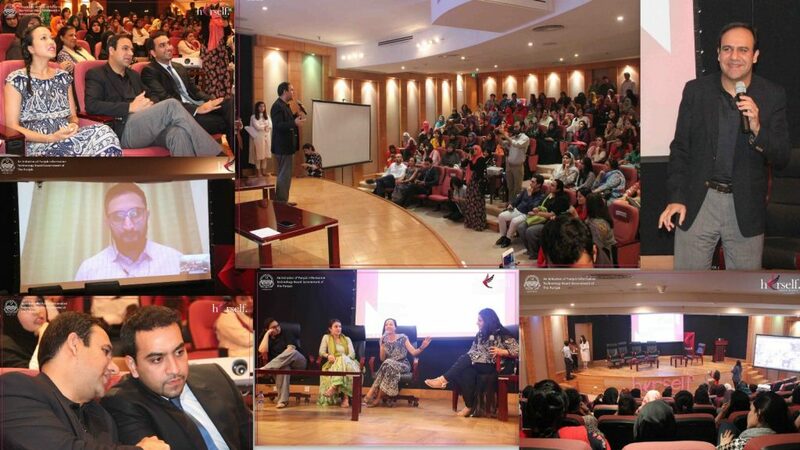 Nabeel A. Qadeer, Director Entrepreneurship and Enterprise Development emphasized the importance of inculcating a sense of leadership and governance among the aspiring female freelancers and entrepreneurs. Keeping in view the theme, Ali Gul (cofounder, Mangobaaz) gave a talk on ‘How to have a digital voice’. Ms. Aurélie Salvaire (Founder The A factor and head of TEDxBarcelona) excited the crowd with a fun activity, engaging them to actively participate in it, after which she conversed with the students on how essential it was for women to follow their dreams no matter how big a hardship is thrown their way. Jennifer Fong (Head of Strategic Product Partnerships at Facebook) and Ms. Kanwal Khoosat (Founder, Olomopolo- media production) also mentored the crowd on how important it is for every woman to understand her passion and make use of it in her life during a productive panel discussion on ‘How to convert your passion into a way of life’ moderated by Sarah Tariq Gilani, Program Manager, Herself and TechHub Connect. The event came to a fruitful end with a Q and A session held where students were directly able to interact with the panelists, followed by drinks and refreshments.